1 bar directly after sports. As part of a varied and balanced diet and a healthy lifestyle. Excessive consumption may induce laxative effects. 1 bar per day. Milk couverture with sweetener (18%) [sweetener (maltitols), cocoa butter, Milk powder, cocoa mass, emulsifier (soy lecithins), flavouring], humectant (glycerol), hydrolysed collagen (15%), calcium caseinate (from Milk) (15%), soy protein (13%), water, whey protein (7,5%), soy crisps (5,2%) [soy protein, starch, salt], flavouring, sweetener (sucralose), emulsifier (soy lecithin). May contain traces of nuts, peanuts and gluten. 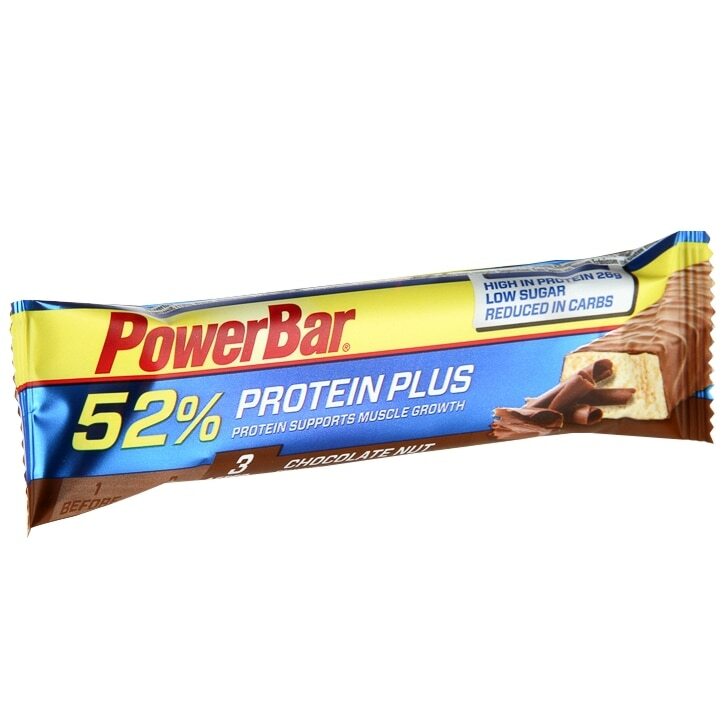 PowerBar ProteinPlus 52% Protein Bar Chocolate Nut is rated 5.0 out of 5 by 3. Rated 5 out of 5 by RPC1 from Tastes good, perfect for on the go I'm very happy with these as a replacement for my old favourite (PhD Diet PhD Whey bars) have been discontinued. Nice flavour and neither too gooey or flaky to eat on he go as an energy boost after or before a work out. Rated 5 out of 5 by Anonymous from Great quality! Great, tasty nutritional bars packed with protein and low on sugar. Perfect!